NACE International, The Corrosion Society, is a pro- fessional technical society dedicated to the prevention and control of corrosion. The organization offers tech- nical training and certification programs, sponsors con- ferences, and produces industry standards and reports, publications and software. Established in 1943, NACE has more than 15,000 members worldwide, provides education, and communicates information to protect people, assets, and the environment from the effects of corrosion. States. The Study, which will be available to the pub- lic in May 2002, will focus not only on the cost of cor- rosion, but also go into the details of the benefits of corrosion control and prevention. This is an important component of the Study and will be a key tool for industry and government. With the total cost of corro- sion to the U.S. amounting to $276 billion per year, the preliminary findings of the Study show that for the marine sector the annual cost of corrosion is over $2.7 billion — addressing the costs associated with water- ways, ports, and ships. It should be noted that this is a low estimate since the corrosion costs of harbor and other marine structures are not included. The key method for controlling these costs is the utilization of coatings. As a leading resource for corrosion prevention NACE has an expanded library of publications related to coat- ings, and more specifically marine coatings, and an more than 70 standards/reports related to coatings. Circle 210 on Reader Service Card or visit www.maritimereporterinfo.com a dramatic increase. The industry has gone from rely- ing on multicoated thin-film technology to single or dual coat thick film technology. Along with these changes has come a greater requirement of surface cleanliness, shorter recoat times, and greater control of the curing process. 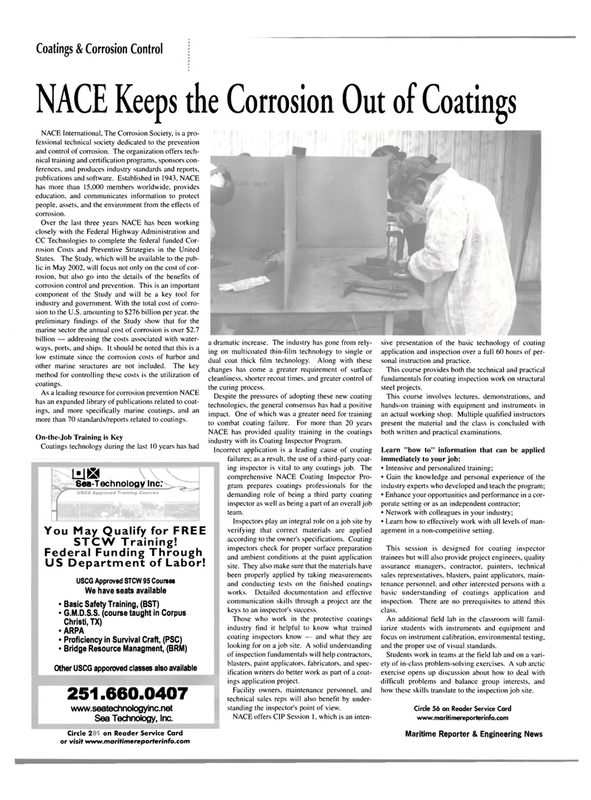 NACE has provided quality training in the coatings industry with its Coating Inspector Program. Incorrect application is a leading cause of coating failures; as a result, the use of a third-party coat- ing inspector is vital to any coatings job. The comprehensive NACE Coating Inspector Pro- gram prepares coatings professionals for the demanding role of being a third party coating inspector as well as being a part of an overall job team. Inspectors play an integral role on a job site by verifying that correct materials are applied according to the owner's specifications. Coating inspectors check for proper surface preparation and ambient conditions at the paint application site. They also make sure that the materials have been properly applied by taking measurements and conducting tests on the finished coatings works. Detailed documentation and effective communication skills through a project are the keys to an inspector's success. Those who work in the protective coatings industry find it helpful to know what trained coating inspectors know — and what they are looking for on a job site. A solid understanding of inspection fundamentals will help contractors, blasters, paint applicators, fabricators, and spec- ification writers do better work as part of a coat- ings application project. Facility owners, maintenance personnel, and technical sales reps will also benefit by under- standing the inspector's point of view. NACE offers CIP Session l, which is an inten- sive presentation of the basic technology of coating application and inspection over a full 60 hours of per- sonal instruction and practice. This course involves lectures, demonstrations, and hands-on training with equipment and instruments in an actual working shop. Multiple qualified instructors present the material and the class is concluded with both written and practical examinations. Learn "how to" information that can be applied immediately to your job: • Intensive and personalized training; • Gain the knowledge and personal experience of the industry experts who developed and teach the program; • Enhance your opportunities and performance in a cor- porate setting or as an independent contractor; • Network with colleagues in your industry; • Learn how to effectively work with all levels of man- agement in a non-competitive setting. This session is designed for coating inspector trainees but will also provide project engineers, quality assurance managers, contractor, painters, technical sales representatives, blasters, paint applicators, main- tenance personnel, and other interested persons with a basic understanding of coatings application and inspection. There are no prerequisites to attend this class. An additional field lab in the classroom will famil- iarize students with instruments and equipment and focus on instrument calibration, environmental testing, and the proper use of visual standards. Students work in teams at the field lab and on a vari- ety of in-class problem-solving exercises. A sub arctic exercise opens up discussion about how to deal with difficult problems and balance group interests, and how these skills translate to the inspection job site.